A number of the things he said made me think. I was of course interested to see the Yale architecture – for a moment I thought the film was set in Oxford. I was also interested in his rather slack treatment of the history and history-of-science background to the project, for example when he was asked about medieval students in the Quadrivium studying music before astronomy. But the thing that I thought was perhaps most interesting was when he brought up the issue of harmony between the different planetary tones. I understand that this was something that was also important to Kepler; his whole project in Harmonices Mundi was the idea that the planetary orbits have important ratios between them, as demonstrated by his well-known diagram showing the Archimedean solids nested between the orbits. The consonant musical intervals pointed out in the interview, are the usual “harmonious” musical interviews of octave, third, fifth, etc. but of course Willie Ruff’s “realisation” using pure-tone generators means that there is nothing special about these intervals. And to me listening, I don’t hear the voices moving into consonant chords and away into dissonances – I hear just a continually changing timbre. To me this fits with the ideas of dissonance theory, that two pure tones have a simple dissonance curve with a maximum about a semitone, and that intervals higher than that get progressively more smooth and therefore ‘consonant’, and that the common musical harmonies arise not from the ratio between pure tones but the overlapping of harmonic partials or overtones. Willie Ruff seems to have missed out on all this! 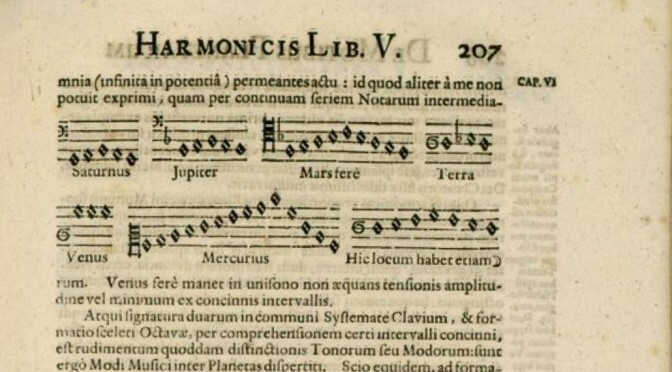 So did Kepler envisage the planetary sounds as complex, harmonic-overtone-rich musical notes, as we might hear from a stretched string or vibrating column of air? That’s the only way his harmonies would become audible. Probably he unknowingly did, as in his day pure tone generators did not exist. I am not sure when acoustic theory distinguished between harmonic tones as produced by strings and wind columns, and non-harmonic pitches as produced by bells and chimes, but I think it was much more recently than the 17th century. It seems to me that Willie Ruff’s choice of pure tone generators is a good choice for capturing the pure, etherial sound of the planets sweeping through space, but a bad choice for illuminating Kepler’s harmonic ideas! Now I am thinking of how this relates to my pure-tone work with the virtual ANS synthesiser. I am thinking of trying a planetary-style composition inspired by Ruff’s ‘realisation’.